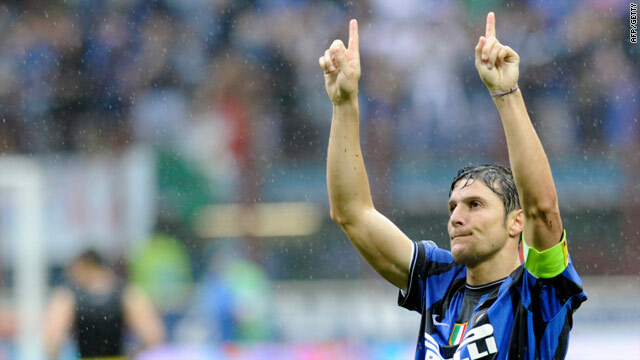 Inter's Argentine defender Javier Aldemar Zanetti celebrates their San Siro win. (CNN) -- Roma captain Francesco Totti scored two late goals as his side beat Cagliari 2-1 to ensure the Serie A title race goes down to the last week. But treble-chasing Inter Milan edged out Chievo 4-3 to hold a two-point lead going into the final round. Andrea Lazzari gave Cagliari the lead with a 73rd minute strike from a free kick but Tottie soon had Roma level in the Stadio Olimpico with a neat turn and shot. An 83rd minute penalty from Totti wrapped up three points in a dramatic turnaround. Inter also lived dangerously at the San Siro after a late Chievo fightback led to a nervy finish for Jose Mourinho's men. Thiago Motta's own goal gave the visitors the lead before Andrea Mantovani also put through his own net to see Inter level. Esteban Cambiasso, Diego Milito and Mario Balotelli then scored further goals for Inter who were in total command until late strikes from Pablo Granoche and Sergio Pellissier for battling Chievo. Inter must now beat lowly Siena in their final match to wrap up the title as they bid for a Champions League, Italian Cup and Serie A treble. "We have a true final at Siena," said Inter's top scorer Diego Milito. "We have two days to rest and then we will prepare for this game." AC Milan's poor end to the season continued as they were beaten 1-0 at Genoa. Giuseppe Sculli's 56th-minute goal settled the match while Milan, who will finish third, had Mathieu Flamini sent-off in the closing moments. The battle for the fourth place and final Champions League spot will also go to the last weekend after fifth-placed Palermo and fourth-placed Sampdoria drew 1-1 in Sicily. Samp went ahead against Palermo through a Giampaolo Pazzini penalty in the second half but Fabrizio Miccoli equalized from the spot as well with 20 minutes left. Like Roma, they are two points adrift with a game remaining. In other action on Sunday, Atalanta's relegation was confirmed with their 2-0 defeat at Napoli with two goals from Fabio Quagliarella. Siena and Livorno were already down. Juventus's 3-2 defeat at home to Parma continued their poor season with a record 14th Serie A defeat and the match was marred by crowd trouble. The defeat ensures Juve will finish in seventh place and have to play in the qualifying rounds of the Europa League next season.